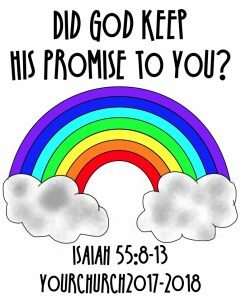 Did God Keep His Promise to You? We are not able to understand everything that God does. Things that seem bad to us will be certainly changed into good in God’s plan. God may have something even better for the things that we think good already. Let’s not lose our hope by assuming the result within what we can see, or compromise only to our expectation. Rather, let’s have a high hope in God. God promises joy and peace for the life we walk with Jesus. Looking back this past year, did God fulfill his promise of joy and peace to you? Did He keep His promise to be always with you, in both good times and bad times?